Pt 2: Face Front, True Believers! Exciting News For All UK Marvel Fans! Change was in the wind in the early Seventies in the form of a business drive to establish Marvel as an offshoot business in the UK. Stan Lee had noticed that their comics were selling in significant numbers in foreign, English speaking countries, and understood that these were potential markets for expansion. Various homegrown British comics in the 1960s (with titles like Pow! and Smash!) had licensed a few Marvel strips as serialised reprints with great success, as had the series of square-format Alan Class reprint titles (they published thousands of black and white reprint comics on very cheap paper, which featured material from Atlas, Marvel, ACG, Charlton, Archie and occasionally other American publishers, including a relatively high proportion of work by Kirby & Ditko), so from October 1972 Marvel UK was established to begin reprinting the back catalogue of American strips from Fantastic Four #1 onwards. 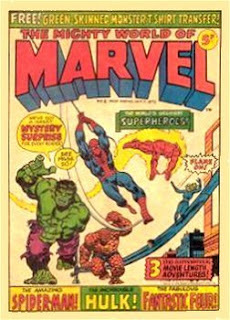 The Mighty World of Marvel was the initial reprint title, followed quickly by Spider-Man Comics Weekly and Avengers. At its peak, Marvel UK was publishing seven regular weekly reprint titles before the bottom began to fall out of the market. Throughout 1973 these black and white titles sat in the newsagents alongside the imported American colour comics, confusing shop owners and some casual buyers equally. Shop owners in particular didn’t understand why there were both weekly and monthly comics with 'Spider-Man' in the title. God knows what they would have made of the current state of the market with its multiple X-Men titles… It was a simpler time back then. By late 1973, Marvel began to consolidate its import operation to run as a sideline to its UK reprint business. The ‘big bang’ changeover was to occur in late 1974, which necessitated a transition period with the existing import system. All of a sudden the influx of American titles stopped without any warning. I remember buying Thor #221 and Avengers #120, and the following month US Marvel comics dried up. Nothing turned up in newsagents the month after, or the month after that. There was no official word about what had happened, and in the absence of the Internet, no way of finding out. Panic set in, particularly in Great Sutton, near Ellesmere Port where I lived at the time. US Marvel had simply ceased to exist if you were living in the UK. We were like druggies denied our fix. For a period of 4 to 5 months, no imported Marvel titles officially reached the UK. The entire run of Marvel titles during April/May to August 1974 would be non-distributed, and for many years after, those issues would be a persistent gap in UK comic collections. Buying direct from the US in the Seventies wasn’t a serious option, since there was no viable way of paying money abroad, short of arranging an international money order which was about as simple then as arranging a mortgage is now. Whole storylines were interrupted and remained tantalisingly out of reach, unless your Dad happened to be some jet-setting businessman who flew Concorde to New York every month and was prepared to bring back some comics for you. 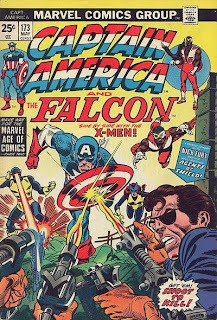 When the US Marvels did return to British shores (amidst much trumpeting from the Marvel UK bullpen about this wonderful new influx of titles – neatly ignoring the fact that most of the UK had access to them previously) it was via a more professional and reliable distribution system, but at the cost of many of the best titles. 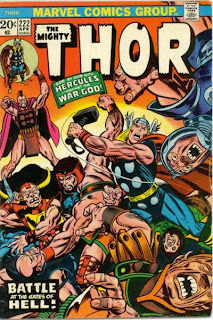 For Marvel had decreed that any US title that bore a similarity to a British reprint comic would no longer be imported. So no more Spider-Man (though in an exception to the rule, Marvel Team-Up, featuring Spider-Man as the lead character in every issue, escaped the cull), no more Avengers, no more Hulk, no more Tomb of Dracula (and later on) no more Conan – in fact pretty much all the big names were gone. What was left was a handful of titles worth buying (Fantastic Four and X-Men also managed to escape the cull) and lots of poor sellers (Astonishing Tales, Amazing Adventures, Marvel Spotlight etc and various horror titles that reprinted late 50s/early 60s strips). The entire Marvel line in the UK had been reduced to 20 titles. But worse news was to come. Leaving aside the matter of the 33.3% price hike that followed the new deal (a 6p cover price had suddenly become 8p - presumably after a 4 to 5 month absence Marvel thought we wouldn’t notice! ), comic collectors discovered that newsagents would only be able to order comics in complete sets of 20. A newsagent couldn’t, for example, order lots of copies of X-Men and Fantastic Four to the detriment of reprint copies of Supernatural Thrillers. He would get equal numbers of each title. What this meant if you collected X-Men was that your local newsagent would now have one, or maybe (at best) two copies of it (if he was prepared to make a bulk order of 40 US Marvels). Suddenly it was a case of first come, first served. If ten kids at school wanted to buy X-Men, eight of them would be disappointed every month. And no, the newsagent couldn’t tell you when the US Marvels would be due in, and no you couldn’t have a particular title put aside, because frankly all those silly American comics looked the same to him, so you had to check on the way back from school every day. Sometimes you got lucky – sometimes you didn’t.